You need a solid tool to make more calls and close more deals, a tool that makings outbound calling a pleasure. Since using Acarda, our outbound calls made have increased by more than 200% and the number of new customers we've been able to service and on-board has also increased by the same amount. The strong scripting tools ensure that our agents are sticking to the script. I strongly recommend Acarda to any telephone focused sales team that wants to dramatically increase their call performance. I looked for software to replace a dated system and found Acarda’s outbound telemarketing software. It had what I was looking for and I am happy to say that we are extremely happy with the product and the support. We are a not for profit organization, Acarda Outbound is affordable yet provides the features to make outbound calls productively. The staff at Acarda are very understanding and helpful. Hurla, S., Kansas City, MO, USA. Our sales department loves Acarda Outbound because it has helped our sales increased 10 fold! Now we plan to add additional staff to increase our sales even more. Acarda Outbound is very functional yet easy to train new employees how to use it. We have been using Acarda’s outbound calling software for ten years! We have grown considerably over that time and the standard of service we have enjoyed has been phenomenal, second to none. Acarda Outbound allows me to manage a large number of campaigns, to assign my agents to work on different campaigns and to monitor how well they are performing. I highly recommend Acarda Outbound to you. Download Acarda Outbound Team Edition - Outbound Call Center and Telemarketing Dialer for a group. 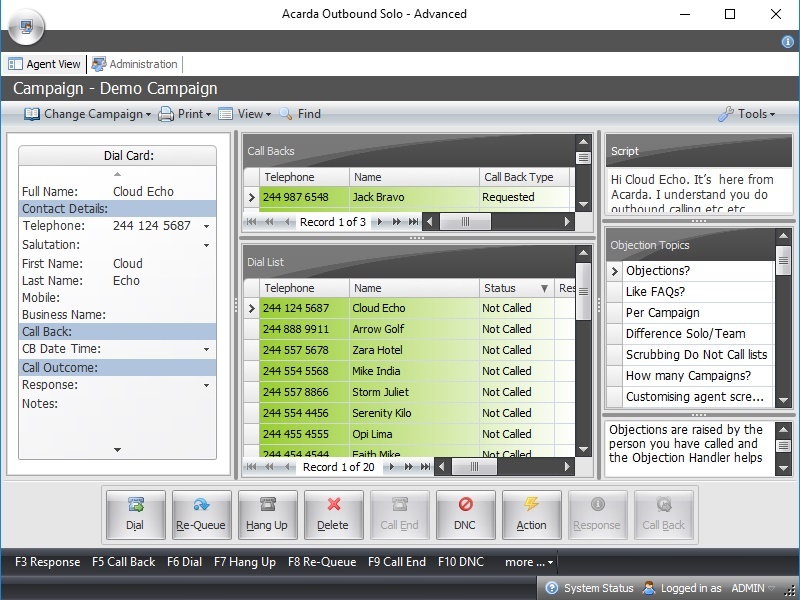 Download Acarda Outbound Solo Edition - Outbound Call Center and Telemarketing Dialer for one person. You can rent or purchase outright. Rental options can be paid monthly, quarterly, or annually. Please contact us for payment links. You can rent or purchase outright by clicking on the desired link below. The rental is paid for a three-month period at a time. Laws and regulations in some countries prohibit autodialers so it is important to clarify that Acarda Outbound has no predictive dialer ability and should not be considered to be an autodialer. It functions as a Call Manager where agents can make notes on each call and record call outcomes. The Acarda Outbound Agent displays contact details like a Contact Management System and then when the agent clicks a button the telephone number is speed-dialed in a similar way to the speed-dialer capability of a memory dial desktop telephone. Once dialed, the agent must then determine the call outcome and select to call it back if it is engaged or no answer or have a conversation and then make notes on the call. What is the difference between the editions of Acarda Outbound? Acarda Outbound is available in two editions, Standard and Advanced. The Advanced edition includes all the features of the Standard edition along with the extra features that give you more advanced reporting, objection handlers, campaign list management tools, and other functions to save you time managing your campaigns and outbound calling agents. You can read more details here. What are the outbound call center key features? 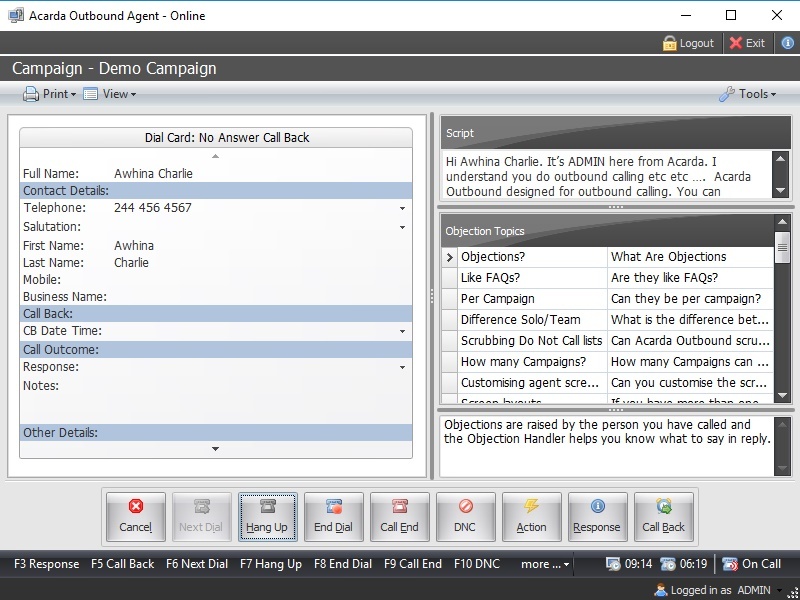 Demand or Preview Dialer – Dialing is initiated by the agent with a single button click which saves the last lead record and fetches the next lead from the campaign queue. The new lead can automatically be dialed as it appears or in preview mode it can be placed on the screen for the agent to review prior to dialing. Intelligent Queue Manager – The Intelligent Queue Manager is at the heart of managing campaign leads to give to agents. Call backs have priorities and can be assigned for requested times and sent to either a specific agent or a team of agents. Call Outcome Reporting – Use real-time reporting on call outcomes to show dispositions per campaign, agent, or selected date periods. Historical Reporting – Understand call center performance by reviewing call history and agent history reports. Monitor agent performance and statistics to ensure your staff and working effectively. Campaign and List Management – Setup multiple campaigns, import lead lists and move leads from campaign to campaign based on imported data or past calling results. TeamMax™ Team Maximizer – Central to Acarda Outbound is our propriety TeamMax™ team assignment approach to call management whereby a group of agents are assigned to a team, and the team of agents are assigned a calling campaign. In the Advanced Edition agents can be assigned to multiple teams and the manager can allow agents to switch between teams and therefore allowing the agent to select which campaign they will work on at a given time. Agent Scripting and Objection Handler – Present a consistent message to prospects and contacts with agent script tailored for each campaign. Furthermore, an Objection Handler (Advanced Edition only) makes available to the agent a list of common objections or questions so the agent can quickly find the best scripted reply. Do Not Call Management – Ensure telephone numbers on DNC lists are not called by importing them to Acarda Outbound’s internal Do Not Call database. Leads are then scrubbed as they are imported into a campaign and also always checked against the DNC list prior to being sent to an agent. VOIP or Conventional PSTN – There is no need for an expensive central dialing computer; rather, the dialing device can be selected in the agent software e.g. dial via a 3rd party-VoIP application that supports command line parameters; or dial via a TAPI modem.